Design makes everything possible. It’s more than a tagline; it’s the ethos that drives Chris Hatfield, creator of the Brick X Brick initiative, which aims to reimagine how we think about blight and transform communities for the better through design. Hatfield launched Brick X Brick more than a year ago after witnessing firsthand the blight impacting portions of his home in Toledo, Ohio. Hatfield invested his own time and money into gathering bricks from dilapidated buildings in poverty-stricken neighborhoods, treating them, and turning them into literal works of art. The idea was to sell them, donating proceeds to local community projects and initiatives aimed at empowering residents and solving core problems. “It was important to me that the proceeds go to the actual community. I want to arm people with things that can help them make the change they need to make; identify their own problems and crush them themselves,” he said. It wasn’t easy; Hatfield had never worked with stone as a medium before. Figuring out the tools, equipment, and supplies involved a steep learning curve. Bits worth thousands of dollars broke. Equipment didn’t work as expected, and the stone didn’t respond how the crew thought it would. Then there was the question of the investment: would this project even matter to people? “I can say to people who buy these bricks, from A to B, your money made a change. These kids have arts programming now in a neighborhood nobody gave a sh*t about,” he said. While he felt relief at the undeniable success of the program, Hatfield also stayed conscious of the potential pitfalls to his project; namely, the potential for appropriation. He partnered closely with community members to ensure proceeds stayed close to the ground and went toward making real, meaningful change. Companies starting taking notice, asking if they could sell the bricks in retail spaces. He avoided that route, believing it lessened the overall impact of the project. Sure, you could just put [a brick] in a retail space or a hotel or something. But that takes the entire meaning and importance out of it. It’s not just a thing to buy; it’s about the mission, and the fact you are making a difference, that your impact counts. When Aaron Stump, VP of Design in the marketing department at InVision, and Amanda Swan, Director of Website Marketing, learned about Hatfield’s project, they knew they wanted to partner with him. Swan reached out, and Hatfield said the fit was perfect. Stump also said the feeling was mutual. It’s on our website and our t-shirts: ‘Design makes everything possible.’ The thing I found empowering was how we can show the community that design can be used for good. I think that’s something ingrained in all designers, positioning design to change people’s lives and make something out of nothing, trash into treasure. It lifts the entire community. InVision commissioned nearly 200 bricks from Hatfield, and he and Stump worked together (using InVision, of course!) 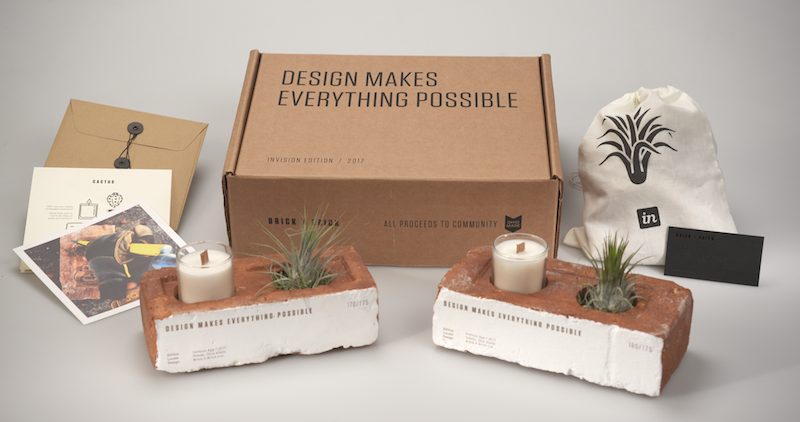 to create a custom look, feel, and packaging for each brick. The first bricks are expected to ship any day now. For Hatfield, Brick X Brick’s success is just a sign to him that the community and world is hungry for more projects of this nature. He said he hopes to continue the conversation and perhaps continue partnering with like-minded companies interested in maintaining the integrity of the project. Do you know an individual or organization using design for good? Share some of your favorites with #DesignForGood on Twitter or Instagram for a chance to win InVision swag!